Frankly, it’s a no-brainer. However, it’s important to make sure you get the design and placement of your icons correct. It’s not enough that they simply look good, or that they are randomly placed somewhere on your page. You need to put them where they can catch your reader’s attention – make it easy for someone to follow you on social media and to share your content with their followers. 2 – Discover what icon style is the best suited for your business. Is your personality flat, chic, retro, gooey or grunge? Jump here. 3 – Expert tips on how to optimize your social media icons. Jump here. 4 – Different types of social media icons: Share vs. Follow. Jump here. Share buttons are easy-to-use links to create a new post on a social network. They do not take your visitors to your social profiles. Rather, clicking prompts them to share your content to a particular social network. Instead of copying the page’s URL, heading over to Facebook, pasting it into a new post, and writing a text caption, your visitors can click ‘share this’, and go back to your site, where you want them. By encouraging readers and new visitors to share your website, you’re reaching a larger, more diverse audience of new people that can discover your business. Share buttons can also help your content go viral and increase referrals. Once your audience has shared your content, it’s even easier for their audience to repost, retweet, or re-pin. You can also control the message a little more than if everyone was manually sharing posts. Most social button tools and plugins let you customize the text to share along with a link back to your site. In short, share buttons are essential for expanding the social reach of your site. They’re also an integral component in building an audience. 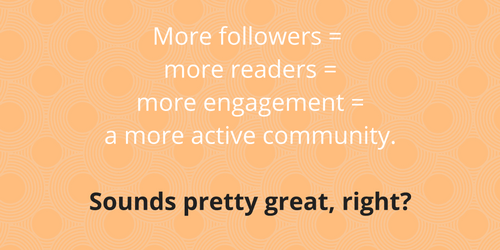 While the actual lingo may vary – like, follow, circle, etc. – the concept is the same on each social network. Follow buttons simply link to your social profiles so people can add you to their network there. It’s pretty rare that someone will see a website once and think, “I’m going to keep up with them forever.” Nope, it takes much longer for someone to become a real fan or customer or even to remember that you site exists. You have to make sure they don’t forget about you. By having readers follow your active social media profiles, you’ll pop up there to help stay top of mind. Connecting with your audience in more than one place helps build a relationship where they’ll come back to your site later. Making those places social helps you drive returning traffic to your site, share original content, and engage directly with your customers. A Google search for social media icons produces masses of options for you, ranging from a clean, flat design, to watercolor, retro, vintage, grunge, gooey and just about everything else in between. In addition to the icons listed above, here is a collection of 100+ free social media icon sets to help save you some time and find the perfect group of icons – no matter what your style! 1 – Free Social Media Icon Set, Always Updated! For the most meticulously updated and accurately crafted minimal social media icon set on the internet. Now including the new Instagram icon! Dustin hand picked the most popular social sites out there and created six different downloadable sets. Contains cool Social Media icons vectors pack with logos of the largest network sites. Download speech bubble composition with vector icons of Facebook, Google+, YouTube, RSS Feed, Twitter, MySpace, Linkedin, Flickr, Digg, MeetUp, StumbleUpon, WordPress, and Blogger. Here is an awesome, trendy set of curled sticker style social media icons that I am sure you will find very useful! Need a trendy and fresh take on a social media icon vector set? Check out this Triangle Vector Icon Set, useful for promoting your website or social media profile. Includes 20 social media vector icons in a triangle shape. Make sure to check out the other 47 free icon sets put together by Vandelay Design. Alexis Doreau’s fantastic collection includes some of the most difficult to find social media icons like SnapChat, Periscope, and Slack. 1 – Where are the most popular places for my social media buttons? Top of post – Do users share before they “actually” read the article? The top of the post is one of the most common placement options frequently used by sites like TechCrunch and Mashable. Left of post – Placing social buttons to the left of the blog post makes a lot of sense, as readers follow text left to right. Right of post – This one surprised me, but it is out there. Social Media Examiner is a good example of a site with this placement. Bottom of post – Placing social media buttons at the lower part of the posts were common, and the only place you will find social buttons on Seth Godin’s blog. Is he missing out on possible shares because of this placement? In-line of post – A growing trend is to place shareable content inline with the rest of your content. We do this regularly on our blog using our Click To Tweet plugin. No social buttons at all – This is a surprising and growing trend heralded by sites like the Signal v. Noise blog by Basecamp. Are they hurting their chances for viral success? We’ll look into this in a minute, but for now, that’s the playing field. 2 – Can you have too may social buttons on your website? Doug Antkowiak makes a great point about social media buttons on the Search Engine Journal blog. He points out that too many social buttons may negatively impact the speed of your website. This impact is a big red flag, as you can clearly link site speed to better readership and SEO performance. The most valuable conclusion is that we should limit the number of social media buttons that we display to as few as possible. The risks of slowing down our site just aren’t worth it. Social media buttons provide one of those situations where more is not necessarily better. This evidence is backed up by TrackMaven’s polarizing conclusion after examining nearly 2 billion social shares. Their data concluded that the vast majority of social shares take place on the top two social networks (Twitter and Facebook). Clearly, we don’t need to include all networks to make a good use of social media buttons. 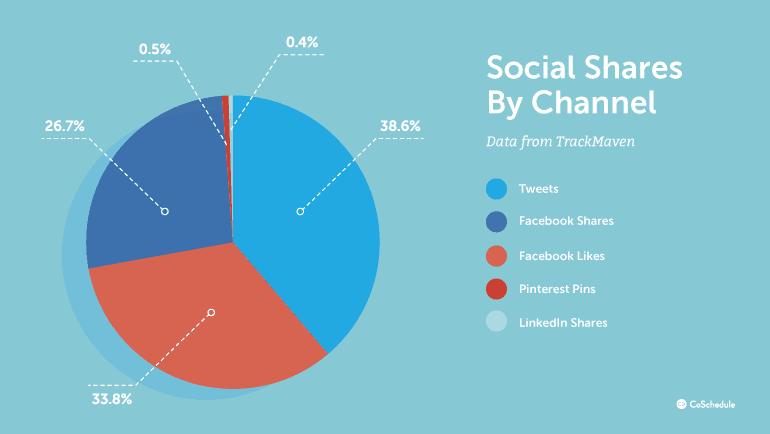 In this report, TrackMaven reveals that 38.6% of social shares were on Twitter. Facebook “likes” and “shares” accommodated for another 60.3%. 3 – Should I use custom or standard buttons? From Jeff Bullas: It’s a real dilemma today when there are many cool social button designs. But there a few pros and cons to using custom social media buttons over standard ones. →Cons: Custom social media buttons can become “invisible” for ordinary users. Most people are used to certain icons on social media. And sometimes attempts to create a unique “Like”, “Tweet” or “Share” icon can lead to people won’t understand that it’s a social button they see. The example below shows the sharing buttons on a website that will do your head in. Don’t make it this hard! Being this smart is sometimes very dumb! 4 – Are social media icons a must in email? On one hand, some people would tell you that social media details will only add to the clutter. On the contrary, social media is a great way for your email recipient to find out more about you and your brand. So how do you decide if you need to include this? If your brand is very active on your social media profiles, then, by all means, add those social media icons. Just make sure your social media profiles are something you are proud of. Ensure that you have valuable content. If you are still in the stage of building your profiles or are barely available on these social media networks, then forget it. 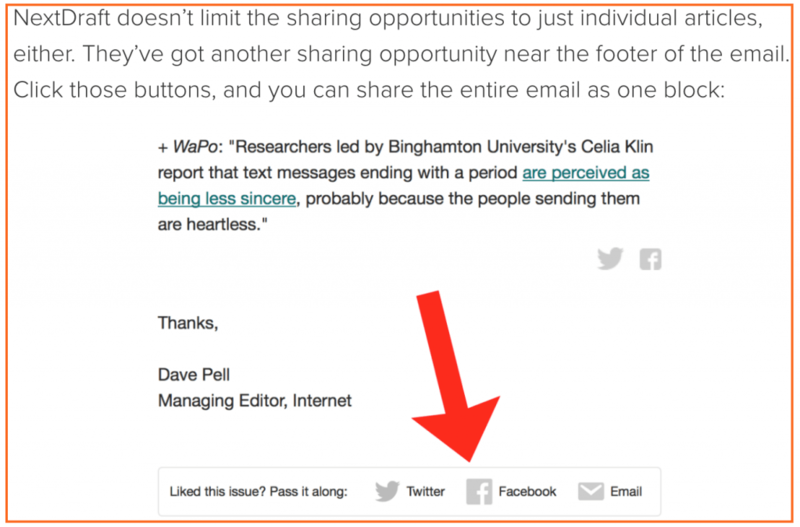 5 – Should you add sharing buttons to all your email newsletters? From GetResponse: Yes, make it obvious and make social media icons look like social media icons! GetResponse found that just adding social media sharing buttons to your regular emails increased the overall conversion rate by 158%. 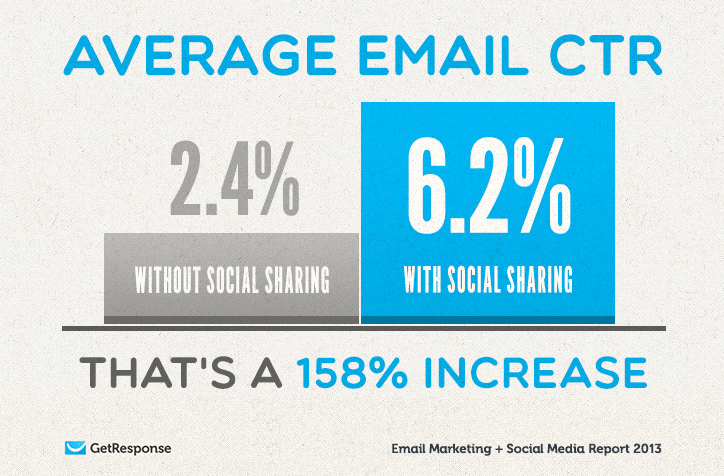 Don’t underestimate how often people share content in emails. Email is one of the most common ways content gets shared. That’s according to Demand Gen’s 2015 Content Preferences Survey. Bottom line: Social media icons in your email signature are a constant invitation for people to connect with you. 6 – Why are visual links to my social profiles important on my blog? Having links to your social media profiles on your blog is an excellent way to increase your followers, but don’t stop there! 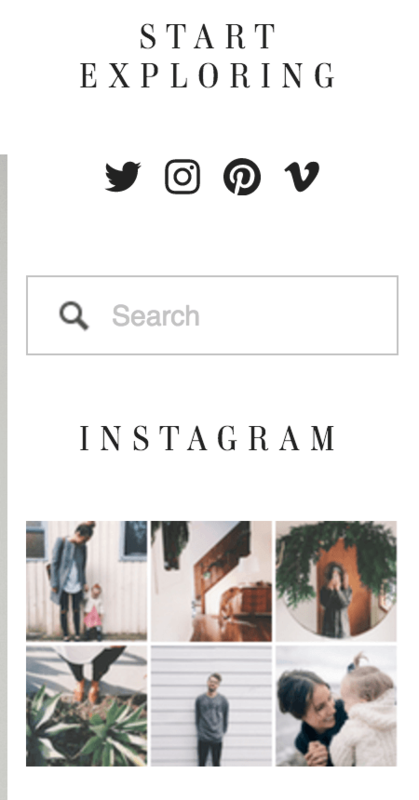 In addition to the usual social media icons, adding an Instagram or Pinterest grid to your sidebar or footer shows your readers what they can expect from following you. A visual reference of your feed is more likely to catch their attention (and have them click through to follow you!). 7 – How can I optimize my social profiles on YouTube? Any opportunity to showcase links to your other social networks, blogs, website, etc. is worth utilizing. With YouTube’s latest upgrade to the look and feel of the channel, there are new ways of displaying your other online properties. 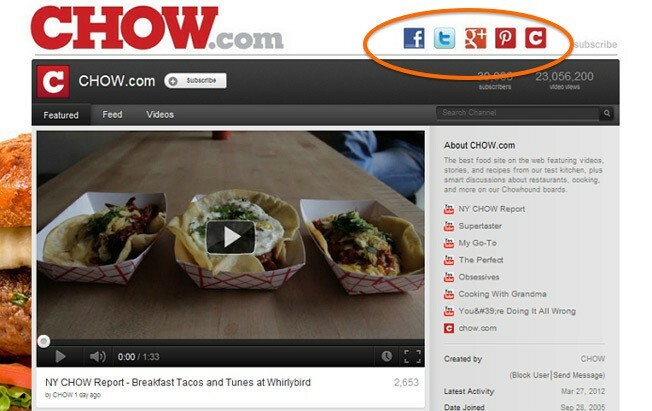 Many brands, like Chow.com, choose to utilize the space about their channel at the top right of the dashboard as a place to link to their Twitter, Facebook, blog, website and other destinations of relevance to their YouTube audience. Customizing the background of your channel, showcasing your other social networks and creating a custom header are just a few of the many ways to brand your presence on YouTube. 8 – Can I showcase my social profiles in my ads on social media? Yes, this is currently in beta and being tested by advertisers in Bing Ads. Bing Ads is currently testing a brand new extension that allows searchers to add their most important social media profiles into their Bing Ads ad, via a new social media extension. The new extension – simply called Social Extensions – allows advertisers to pick up to 4 social media profiles to showcase. For now, Twitter, Facebook, Instagram, and Tumblr are the ones to choose from, but support for Pinterest is coming, and possibly for YouTube as well. The Twitter example is interesting since it shows that you don’t just have to link to your Twitter handle, linking to branded hashtags – or any hashtag at all – is something that you can do. Where do you go for free social media icons? Hi Dustin – It’s a great set of icons. Thanks for ALWAYS being on top of social media for us~!